Tonight’s performance spotlights two very different Russian symphonies: Prokofiev’s short “Classical,” written in homage to Haydn, and Tchaikovsky’s lush, romantic Fifth Symphony, whose second movement offers one of his best-known melodies. 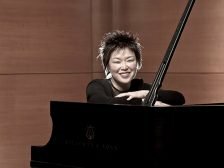 Katherine Chi returns to Huntsville to perform the cheerful, athletic Piano Concerto No. 2 by Shostakovich, written for the composer’s own son upon his graduation from conservatory and featured in Disney’s Fantasia 2000.